As we just mentioned, safety is our first concern when it comes to working on your chimney. We know how to properly handle chimney care, from cleaning out hazardous soot and creosote, to navigating your roof for chimney repairs. We have years of experience and the training necessary to perform chimney services. In addition, we have the proper tools to safely inspect, repair, and clean chimneys. Plus, our team is licensed and insured to work on chimneys, which means that if an accident should happen while we’re on the job, you won’t have to deal with the consequences. So, don’t turn your chimney care into a DIY job. Trust the pros here at Chimney Care Plus. With Chimney Care Plus, you can rest assured that we have the right tools and the proper know-how to complete your chimney care project properly — without damaging your home or your chimney. From cleaning to tuckpointing, we use the right tools of the trade to ensure that your project is completed thoroughly and efficiently. For instance, when we clean a chimney, we use brushes, vacuums, and cleaning solutions that are specifically designed for chimney cleaning, so that your chimney will be wholly clean within about an hour of us arriving on site. Instead of buying all the right tools yourself, you can simply pick up the phone for dependable chimney care. 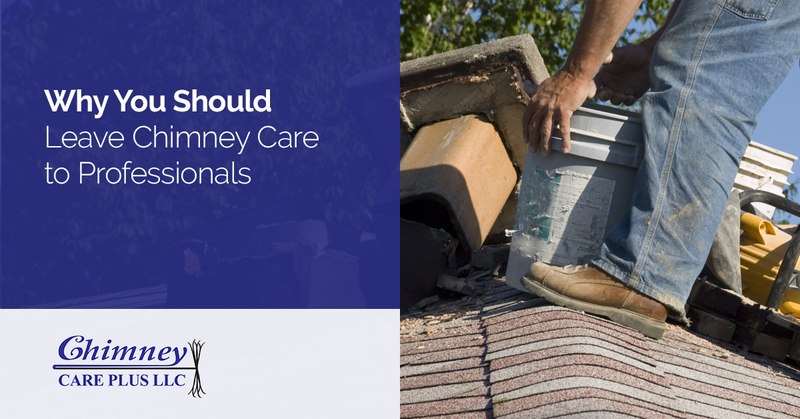 Experience goes a long way regardless of the profession, and chimney care is no exception. Our professional chimney care specialists have years of experience in the business — proudly serving frederick and surrounding counties since 2005 — so you can trust that we know what we’re doing. Your chimney will be in tip top shape after the Chimney Care Plus crew has done their job. When it comes to chimney care, a mistake could be hazardous and expensive. For example, if you’ve decided to clean the flue of your chimney yourself, and you’ve left behind a big swath of creosote, your chimney is liable to catch fire whenever it is in use. Chimney fires are still rather common, and in fact, cause over a 100 million dollars worth of damage to homes in the United States alone. Homes may burn down entirely if a chimney fire should occur, and there are about 25,000 reported incidences of chimney fires every year. As the Chimney Safety Institute of America (CSIA) points out, “the temperatures (chimney fires) reach are very high and can cause as much damage to the chimney structure – and nearby combustible parts of the house – as their more spectacular cousins.” So, instead of cleaning your chimney yourself, you might get better peace of mind if you hire a professional crew for chimney care. If you’re doing work on the exterior of your chimney, and you have to access your roof, you should be wary that you may void the warranty of your roof, simply by working on your chimney. Many roofing installers and roofing material manufacturers offer warranties to cover their workmanship and products these days. However, some of these warranties may be voided if work is performed atop the roof — especially if it is performed by someone who isn’t a professional. For instance, if you’re working on the flashing of your roof, and you damage the shingles of your roof along the way, then you may void your roof warranty. If you’re concerned that you may void your roof’s warranty, then it’s best not to take a chance — you could end up saving yourself thousands in the long run. Well, we hope you’re convinced that chimney care should be left to professionals. We strive to keep homes and their residents safe with our chimney care and cleaning services. For chimney care, cleaning, and inspection services here in Frederick and the surrounding counties, you can always trust the professional chimney experts here at Chimney Care Plus. Schedule your service today!